In cooperative education programs, it has been well documented that students learn at an accelerated pace when compared to academic-only programs. Typically, we cannot be specific in terms of what exactly is learned on the job. In some cases, however, cooperative education faculty can indeed get specific in attuning their students in terms of what they should seek to learn on the job in order to help them actively participate in their on-the-job learning. This article discusses a curricular change being developed for architecture co-op students who are seeking to become licensed professionals. In short, without placing extra requirements on employers, students in this program are asked to learn the specific aspects of professional work which they will need to know in order to practice at a level worthy of professional licensure. We will discuss the contents of the criteria, how criteria are developed in relation to professional licensure requirements, proposed student assignments during the co-op term, and reflection afterward. These issues will be described in relation to how they benefit student learning and incentives as they relate to meeting professional licensure requirements. This is a curricular change which is currently being implemented. Subsequent articles will cover the progress of this program in terms of student participation and reflection, employer evaluations, and eventually student outcomes. Since the beginning of this millennium, the number of Architecture professionals has been declining as a result of a number of demographic and socioeconomic reasons. First of all, the baby boom generation is matriculating into retirement, and there are fewer people in lower age brackets who can replace them. The general population pyramid shift affects other professions, therefore the paradigm of the architecture profession may shed some light on how to address this issue. Other factors more particular to architecture are 1) its decline during the 2008 – 2012 recession. The architecture profession typically faces sharp declines during economic recessions and sharp increases during recovery periods. During the “Great Recession” of 2008 – 2011, the number of licensed architects fell by 6.85% . Many who lost their jobs during that time found permanent positions in other industries. 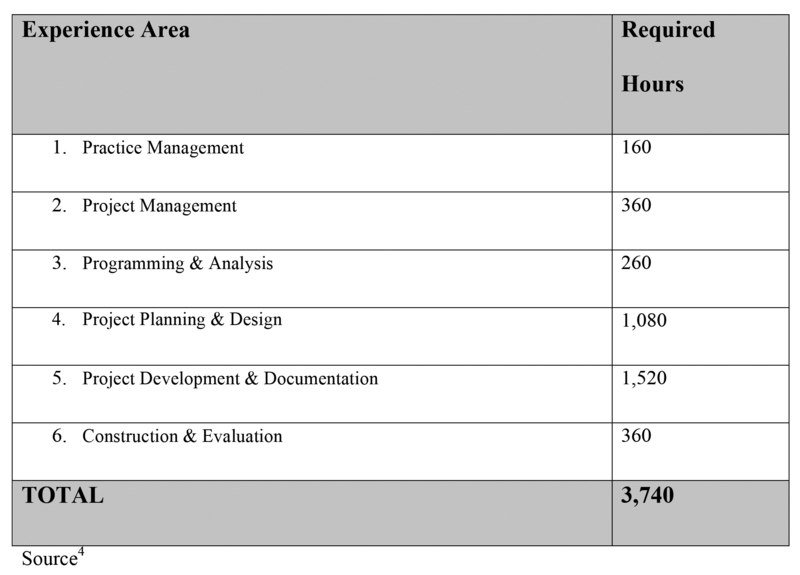 2) The licensure requirements for architects are more demanding than most professions. The average age at which architects earn licensure is currently 32. This can be a major detractor to young people contemplating their career and can explain the fact that, according to NCARB by the numbers, the number of licensed architects grew by only 3.37% between 2005 and 2015, while the general U.S. population grew by 8.43%. The demand for architects is still high, however, the profession is facing a shortage and if architects are not available to meet that demand, the construction industry will find ways to replace the work of architects ultimately at the expense of the built environment’s quality. This is already happening with the advent of owner’s representatives, construction managers, and contractor-led design build enterprises who are taking over roles traditionally held by architects. To stem the tide, the profession has been trying to find ways of shortening the licensure process while maintaining its integrity. Architectural licensure which is standardized by the National Council of Architectural Registration Boards (NCARB) and administered state by state is based on three requirements: Education, Experience, and Examination. These were completed in succession until 2010, when the profession, with the intention of streamlining the process, allowed these requirements to be completed in overlapping timelines. Education and Experience can happen simultaneously. The education requirement is governed by the National Architectural Accreditation Board (NAAB) and the experience requirement is prescribed by NCARB’s Architectural Experience Program (AXP). It was instituted in July of 2016 to replace the Intern Development Program (IDP) which although well-conceived, was more complicated and less connected to the examination. For the examination portion of the licensure requirement, NCARB allows qualified students in certain accredited university programs to take the six licensure examinations before degree completion. This initiative, first piloted at 14 NAAB-accredited schools of architecture in August of 2015, is named Integrated Path to Architectural Licensure (IPAL). The IPAL program allows for the completion of all three licensure requirements (education, experience, and examination) to be completed before graduation. Among these was the University of Cincinnati (UC), which because of its well established co-op program, is better positioned to be successful than most. Students must apply and qualify to participate in the IPAL program by having completed a minimum of 2000 of the 3740 required hours in AXP before beginning their first graduate level co-op, and committing to take all six sections of the Architectural Registration Exam (ARE). In each of the program’s first three years, about one third of the graduate class at UC enrolled. The other two thirds opted to take their AREs after graduation. Over the six sections, 96 individual “tasks” or areas of knowledge are listed in a checklist fashion making it easy for students to identify depending on what they are doing at any given time. The minimum required length of the “experience” portion of the licensure requirement is two years of full time work, or approximately 96 weeks. Therefore, if on average, one task is covered per week, students can complete their experience portion at this pace during six semesters of co-op. Students who enter the Master of Architecture program with a degree from another pre-professional architecture school can average two tasks per week during their three co-ops in graduate school. This is still a very manageable pace. The examination portion of the licensure requirement tests students on both their academic education, as well as what they are learning during their professional experience. In order to give students the best chance of success, the co-op program needs to prepare and support students in their self-directed learning — a central concept of cooperative education. The 96 tasks given through AXP are therefore a clear roadmap for students seeking to learn what is expected of them as they become licensed professionals. Once they review and become familiar with these tasks, they recognize when they are mentioned at work and know to pay attention. They can ask about them when working on a related task, and in some cases they can research by studying past projects with the employer’s permission. Typically, the abilities listed in these 96 tasks have not been fully acquired upon licensure until several years after graduation. Remember, until 2016, there was no concise list like this in existence. Before AXP, there were areas of knowledge and abilities which were much lengthier and drawn over 17 experience areas making it much more difficult to use effectively, and it had no connection to the ARE’s organization. Currently, since the average age at which architects become licensed is 32, many practicing architects are skeptical about the ability of an architect who just became licensed upon graduation. It is well recognized that professional experience beyond academic education is essential for competent architectural practice. After all, since professional licensure was first legally instituted in the United States in 1897, professional experience was required. Therefore shortening the time to licensure must happen in the context of focusing on what is to be learned during the experience period. In our case, it means helping students focus on what it is they need to learn while on co-op. Merely giving students the list of 96 tasks is certainly helpful, but not enough. To effectively accelerate professional capabilities, students need guidance from an architect faculty member before co-op begins in order to understand the importance of these skills, setting up the expectations, the organization needed to follow through, and to see examples in terms of the depth of understanding required in each of these “tasks.” Familiarity with these tasks and the fact that they are agreed upon by their profession gives students the confidence that they will have the knowledge and abilities necessary to practice effectively. In turn employers and potential employers can ascertain that they are effectively developing the capability of handling the work at hand. If used effectively, this guide has the potential to help students gain confidence in their abilities while instilling the confidence employers have in them. Developing a professional level of competency at an earlier age increases students’ potential level of success and choices in how they can define their career path. Obtaining licensure at an earlier age as a result of an accelerated and more focused process can bring leadership opportunities within reach sooner as well. At this point, the AXP program is in its early stages and although its potential makes sense, the UC architecture program is evolving its method of administering it to co-op students in both the Bachelor of Science in Architecture (BSArch) and the Master of Architecture (MArch) programs. Currently, students in both programs are introduced to the architectural licensure process, AXP, and its organization into six general experience areas, its coordination with the ARE, and of course the all-important 96 “tasks.” Since BSArch students often do not pursue licensure, assignments during co-op related to AXP are given to graduate students who are over 95% likely to pursue licensure. MArch students are taught the use of AXP tasks by a licensed architect who is familiar with them, and during co-op they are asked to cover 32 tasks over the 16 week work period. Upon return from co-op, students turn in a copy of the 96 tasks having checked off the ones that they completed, and during a one-on-one appointment they are randomly quizzed on the ones for which they claim familiarity. The MArch class of 2020 which enrolled in fall of 2017, is the first to follow the above set of directives. Over the next two years, we will follow the students’ success rate in terms of level of proficiency ascertained through one-on-one meetings, architect employer comments, student comments, progress toward professional licensure, and first career steps post-graduation. Next year, initial results will provide feedback on how to continue to boost student competency, and provide a path for success. From Pyramids to Pillars: Two Centuries of Change in the U.D. Population, 1860 to 2060; United States Census Bureau; March 2018. NCARB Surveys of Architectural Registration Boards and Registered Architects 2008-2011. NCARB by the Numbers. NCARB by the Numbers: Insights on NCARB Data and the Path to Licensure; June 2015. Architecture Experience Program Guidelines; May 2017. Introduction to Cooperative Education: A Student Text/Workbook, Fifth Edition; The University of Cincinnati; McGraw Hill, 2010. Architecture: The Story of Practice; Cuff, Dana; MIT Press, 1992.